As part of the Southeastern Shared Health Research Informatics Network (SHRINE), ACTSI is collaborating with Clinical and Translational Science Award (CTSA) Hubs including the University of Alabama at Birmingham, University of Arkansas, University of Kentucky, and Medical University of South Carolina, to federate available data at each institution for assessment of clinical trial feasibility, participant recruitment, and comparative effectiveness research. All partnering institutions bring strong experience in the deployment, use, and extension of i2b2, in federated query infrastructure, and in participation in the development of PCORnet-style data sharing. Together, the group developed and is maintaining i2b2 and SHRINE instances with a common SHRINE ontology, focused on multiple testbed areas of care, and established a shared governance model to access from the data network. 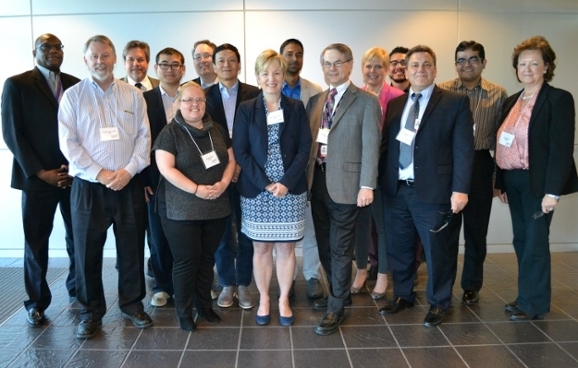 Southeastern SHRINE met face-to-face this spring, hosted by the Translational Research Institute at the University of Arkansas for Medical Sciences.